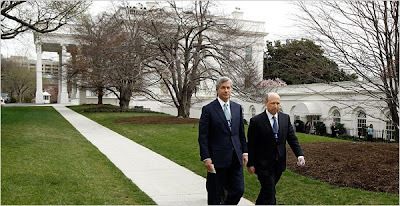 I love the photo in this piece; after Ben Bernanke and Lawrence Summers - you have the next 2 most powerful men in our financial mind meld between D.C. and our elite financial oligarchs. How best to represent the "melting pot" of NYC and D.C. than having JPMorgan's (JPM) annual meeting in D.C.? With Rahm Emanuel attending to boot. For those who are new to Dimon, he has been the golden child for a long time, even as a guy in his early 40s he was assumed to be the one to take over Citigroup once long time CEO Sandy Weill stepped down. But like a soap opera, Dimon was backstabbed so he fled to (at the time) struggling BancOne which ended up assimilating into JPMorgan with Jaime as CEO of all the lands... and in the end he exacted revenge on those who shunned him. Or put another way, say hello to your future Secretary Treasure within a decade. Let the oligarchy grow... and prosper (even more if possible?). Jamie Dimon, the head of JPMorgan Chase, will hold a meeting of his board here in the nation’s capital for the first time on Monday, with a special guest expected: the White House chief of staff, Rahm Emanuel. Mr. Emanuel’s appearance would underscore the pull of Mr. Dimon, who amid the disgrace of his industry has emerged as President Obama’s favorite banker, and in turn, the envy of his Wall Street rivals. It also reflects a good return on what Mr. Dimon has labeled his company’s “seventh line of business” — government relations. The business of better influencing Washington, begun in late 2007, was jump-started just as the financial crisis hit and the capital displaced New York as the nation’s money center. Then Mr. Obama’s election brought to power Chicago Democrats well-known to Mr. Dimon from his recent years running a bank there. Another Obama associate is on JPMorgan’s payroll. Mr. Dimon hired William M. Daley, a former commerce secretary and Chicago powerbroker, in 2004 as vice chairman and head of Midwest operations. Since 2007, Mr. Daley has overseen global government relations. With the crisis, Mr. Dimon, a longtime Democratic donor, has become even more politically engaged, in the process becoming perhaps the most credible voice of a discredited industry. Other onetime giants like Citigroup and Bank of America find themselves muted as wards of the state. In recent months, he has met with officials including Mr. Geithner; the White House economic adviser, Lawrence H. Summers; and lawmakers of both parties. He phones or e-mails Mr. Emanuel at whim. Each week, his staff gives him the names of a half-dozen public officials to call. Mr. Dimon and Mr. Geithner know each other well from the Federal Reserve Bank of New York, where Mr. Geithner was president and, as such, a JPMorgan regulator. Mr. Dimon sits on the New York Fed’s board. Because if there is one group of people you want who on a board, it is bankers - the very folk the board is regulating - do you see YET AGAIN - how broken our "board system" is - private and public. Oh wait, I hear the dogmatic talking points coming from the heavens "it's a free market, it's working fine". Yep - working like a charm! The two men spent untold hours negotiating in 2008 when the government enlisted JPMorgan to buy some of Bear Stearns’s assets and Washington Mutual to prevent their collapse. So what's the next lobbying angle? ... if it translates into victory on the broader financial regulation fight that is just beginning. A centerpiece of that effort involves regulating the market for derivatives, which Mr. Dimon’s firm dominates. While JPMorgan favors new reporting requirements for the complex financial instruments, it opposes the administration proposal to force trades onto public exchanges; doing so would likely cut into the firm’s lucrative business of selling clients custom-made instruments. Like other banks, it also opposes a new consumer agency for financial products. So watch for a cheery, balloon filled, Obama smiling, announcement on regulation of derivatives, with enough "oligarch negotiated" loopholes to drive a Brink's truck through.